Africa: Are Africans Freedoms Slipping Away? The opposition Peoples Democratic Party (PDP) in Nigeria has filed a petition at the United Nations (UN) against President Muhammadu Buhari. In a letter to the UN Secretary General, Antonio Guterres, the National Chairman of PDP, Uche Secondus, told the world body that Mr Buhari has a predetermined plan to use federal agencies like the Independent National Electoral Commission (INEC), the army, and the police to 'truncate' Nigeria's democracy. The PDP, in the letter which is dated April 30, 2018, accused Mr Buhari of violating the Nigerian constitution and persecuting members of the opposition, as well as attacking journalists and "well-meaning" Nigerians who hold different opinions from Mr Buhari's party, the All Progressives Congress (APC). The British, German, French, Chinese, the U.S, and the Russian embassies in Nigeria, as well as the European Union secretariat in Abuja, were copied in the letter. The PDP said the Federal government was behind the spate of violent killings between herdsmen and farmers in different parts of the country. The party mentioned the recent arrest and arraignment of a senator from Kogi State, Dino Malaye, and how another senator, Matthew Urhoghide, was physically attacked by pro-APC thugs in his home state of Edo as evident of the president's intolerance of opposition and criticism. The attack of the PDP senator, Mr Urhoghide, at the Benin airport, came days after he called for Mr Buhari's impeachment in the Senate for approval and withdrawal of $496 million from the Excess Crude Account (ECA) without the lawmakers' consent. Mr Malaye, though a member of the ruling APC, has been a constant critic of the president. Before his dramatic arrest and arraignment, the senator was engaged in a running battle with the police. The police in March accused Mr Melaye of arming political thugs in Kogi State. He was later declared wanted for alleged complicity in a murder case. The PDP, which accuses Mr Buhari of being desperate to retain power, said the president was shielding his corrupt party members from the law, while allegedly using the guise of anti-corruption to witch-hunt members of the opposition. President Buhari recently declared he was going to run for a second term in office. "In Kogi, Borno and Kaduna states, there are reports of the government sponsoring agents to attack and destroy properties belonging to opposition members and supporters. "The Governor of Kaduna s5tate demolished a property belonging to an opposition member and perceived political opponent; the PDP secretariat in Borno state was demolished; whilst party's properties and those of supporters were destroyed by agents of government in Adamawa State," Mr Secondus said in the letter. 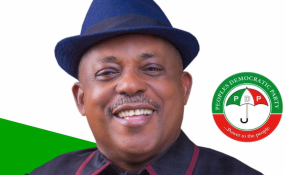 Mr Secondus also said, "All notable opposition leaders are being harassed or hounded by security operatives using all manners of frivolous and vexatious allegations. "Today, despite our constitutionally guaranteed freedom of association and speech, Nigerians now live in fear of this intolerant, overbearing, bigoted and dictatorial administration seeking to foist a fascist regime on our country. "How do we explain or justify the evil plan of the APC-led federal government to monitor citizens' phone calls and social media communication purportedly to check for hate speeches without any enabling law? "We decry this raging intimidation of our party officials, members and supporters and call on the United Nations and the international community to stand up and condemn this drift towards stone-age despotism. Nigeria is a democratic state and we reject any attempt by anybody to suppress the constitutionally guaranteed rights of the people, particularly, regarding the choice of how they should be governed." The PDP assured the UN Secretary General that the party would continue to pursue the ideals of democracy for the common good of the people as laid down by the founding fathers of our party. The opposition party lost to the APC in a keenly contested election in 2015 that saw former President Goodluck Jonathan conceding victory to Mr Buhari even before the final results were officially announced. The ruling APC has consistently accused the PDP of destroying the nation's fortunes while it held sway for 16 years.